What you are looking at is a dream come true. It is not released yet but version 1.2 of Scott's "MailTags", whose Mail tagging feature set alone was worth a donation now ties Apple Mail to iCal as well. Back and forth. Real time. Tagable, Searchable, Smart Mailbox-able. it will add a link to the message in the url part of the todo so if the right mouse the url and select go to location-- it brings up the message in mail (even if you move the original message to a different mailbox) . You should also be able create smart mailboxes based on presence of todo/ and todo complete state. Another awesome feature is conversation filtering, where typing a search string reveals the usual options slice and when you select "Conversation" it shows you only matches where the "To:" and "From:" (and I believe "CC:") contain matches. Sort of like Google Mail. 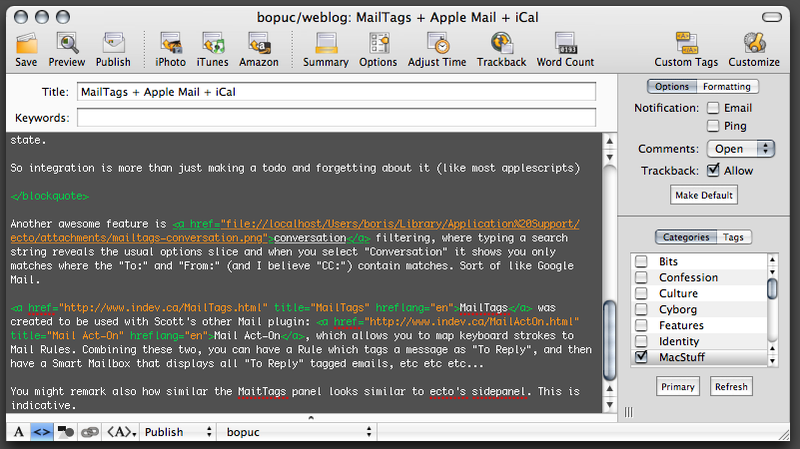 Had another email exchange with Scott and we may yet see some very awesome Finder and Spotlight integration. *Click Project name* -> Reveal a Folder you Aliased to that Project OR anything tagged with said Project label, system wide... Drooling. See, this is how CRM for the Mac should work. Very exciting, awesome work! Love these two Mail add-ons. Thanks for all your hard work! Ooh, ooh, any idea when we of the proletariat get to play with this? How does that compare with, say, Daylite? Seems to have similar integration capabilities, but going as far.